Cinemas in Saudi were shut down following the country’s adoption of hardline religious legal codes in the early 80s. 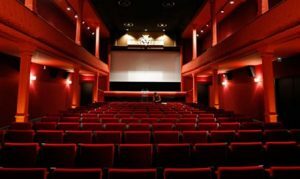 On 18 April, Saudi Arabia will open its cinema screen for public ending a 35-year-old ban on cinema. Black Panther will be the first film to be screened at a newly built theater located in the country’s capital of Riyadh. As part of the deal with Ministry of Culture and Information, AMC, world’s biggest cinema chain, will open up to 40 cinemas in some 15 Saudi cities over the next five years. Saudis have been enthusiastic consumers of Western films but have been confined to watching them privately on their TV sets and phones. It is expected that the Kingdom, whose population exceeds 32 million, the majority of whom are under 30 years of age, would form the largest market for cinema industry in the Middle-East. However, the latest development is a part of an ambitious plan of Saudi Crown Prince Mohammed bin Salman who has started a huge drive to reinvent and reform the ultra-conservative country. He has also announced that women would be permitted to drive in Saudi Arabia from June 2018, another move that will upset the Islamic hardliners in the Kingdom. Both Saudi authorities and cinema operators believe there is a huge untapped market that could generate up to $1bn (£710m) in annual ticket sales through some 350 theatres by 2030, BBC reported. Following his rise to prominence last year, the 32-year-old prince launched an anti-corruption drive that has seen hundreds of people, among them senior princes and prominent businessmen, detained and offered pardons in exchange for financial settlements with the state. Despite the enthusiasm surrounding the move, critics are skeptical whether it will help usher in a new era of free speech. “I don’t think it ushers a new era for freedom of expression,” Joseph Fahim, an Egyptian film critic and programmer, told Al Jazeera. Also millions of people in the kingdom already have digital access to films through online-streaming sites like Netflix. Also there is lack of clarity over kind of films that will be allowed to be screened publicly.